Feeder Finger, a division of Automation Technical Services, kicked off their sales and marketing relationship with Trans-Tec on July 19, 2018, in Phoenix, AZ. Feeder Finger is very excited about the launch of this relationship with Trans-Tec. This relationship will provide Yamaha and iPulse customers the ability to work with their current supplier to enhance their Pick and Place machines to handle cut tape demands. Twenty plus team members from Trans-Tec joined the training and kickoff session. Many of the representatives have begun engaging their clients with demo units of the Feeder Finger’s and reported strong interest. Both companies anticipate a larger volume of consumption in the next few months. 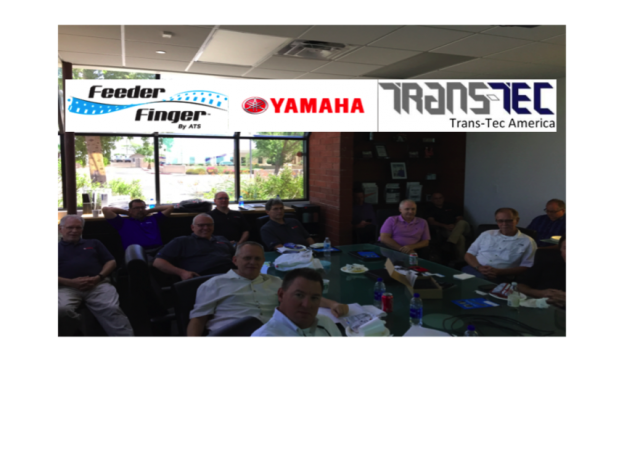 On May 9TH 2018 Feeder Finger signed a distribution agreement with Trans-Tec America to distribute their Yamaha and iPulse Cut Tape Solution in the US, Mexico, and Canada. ATS designed the Feeder Finger to fit each feeder model precisely. The high-quality anodized aircraft machined aluminum replaces the existing tape guide. Feeder Finger allows for an unskilled operator to easily supply taped components by merely inserting the tape itself without the need for splicing or complex routing of the cover tape through the feeder. Buy what you need and save on extra costs now associated with cut tape solutions in the market. The Yamaha SS YS ZS and iPulase F3 Feeders can now be set up a time-tested 50% fast and cover tape feeder jams during production are a thing of the past. Contact your Yamaha representative to demonstrate the New Cut Tape Solution.